A few years ago I had just finished washing my truck and had planned on wrapping up with a wax and detailing the wheels and tires before dark set in. My truck sat there, its detail still in its infancy stages, but it was nicely prepped, with water droplets sparkling all over the freshly washed paint. I reached for my chamois to dry the truck. Precisely at that moment, the phone rang and I went into the breezeway to answer it. It was a semi-emergency call (let’s leave it at that) and I got sidetracked, temporarily forgetting about my half-finished truck. Ten or 15 minutes later when I finished the conversation, I realized I was still clutching a chamois in my hand, but had left the truck to air dry. I gasped in dismay as I witnessed the water spots that had congealed on the otherwise pristine surface. Back to square one. Pollution plays a huge role in pesky water spots and rain etching. Both occur when beads of water evaporates too quickly. If evaporation takes place slowly, there usually isn’t a problem. Water houses pollution, whether airborne, or from underground sources, and when rapid evaporation takes place, contaminants are left behind, creating spots of dirt and acid on the surface of your car. Water spots—Phase one—is the term for residue while it is still sitting atop the finish. 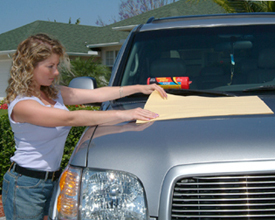 These can be removed with a pre-wax polish, like Wolfgang Paintwork Polish Enhancer. Phase two—rain etching, referred to by some as acid rain, is much more serious. This is the result of allowing water spots to remain too long; they eat through the clear coat and can only be removed by buffing. Avoid both by manually drying your vehicle after washes and after rains before evaporation takes place. I know this isn’t always possible, especially places like Florida where it rains daily over half the year. I keep a Water Sprite Plus in my trunk, just for these occasions. The beauty of the Water Sprite is that it’s ultra-absorbent, and, after using it, you can wring it out and store it damp, and it still dries every bit as well next time! Moral of the story is dry your car, truck or SUV after washing, and after rains, when possible, before water spots show up. Save your finish, and the hassle, by drying. We have a variety of drying tools to choose from: some natural, some synthetic, and some even powered by electricity. Do it your way, but just do it. How to Avoid Water Spots, Water Etching, and Acid Rain.